X Factor 2016: Calvin Harris ‘to join Nicole Scherzinger at judges houses’! Calvin Harris is reportedly in talks to join X Factor judge Nicole Scherzinger at Judges Houses. Taylor Swift and Calvin Harris have reportedly split after 15 months together. 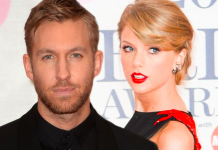 Taylor Swift and Calvin Harris named richest couple 2015! Super couple Jay Z and Beyonce have topped Forbes richest list for the last few years, but now Taylor Swift and Calvin Harris have kicked them off. Calvin Harris nudes leak online, lawyer threatens legal action! Calvin Harris is reportedly 'worried' after nudes he sent privately have leaked online, his lawyer has threatened legal action. Rita Ora and Calvin Harris split up after 1 year together! Rita Ora and Calvin Harris have ended their relationship after almost one year of dating. Rita Ora gains her fourth number one single! The 23 year-old is once again on top of the Official UK Singles Chart with her new single ' I Will Never Let You Down' which was produced by her boyfriend. The UK's biggest pop festival returns to Glasgow this year: Radio 1's Big Weekend. Over 60,000 music fans are expected to attend the event.